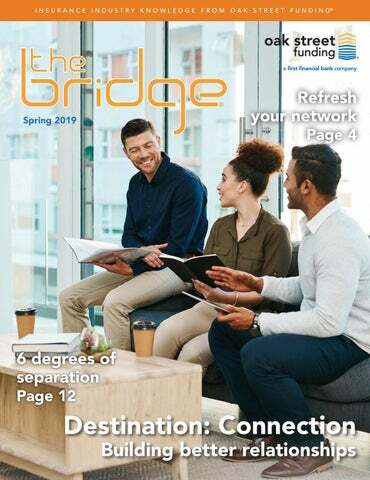 Share Your Thoughts If you have any questions, comments or ideas for The Bridge®, let us know. Email us at marketing.box@oakstreetfunding.com or visit us on social media. Oak Street Funding does not make any representation as to the accuracy or suitability of any of the information contained in any third party advertisements or websites and does not accept any responsibility or liability for the conduct or content of those advertisements and websites and the offerings made by the third parties. Third party advertisements and links to other websites where goods or services are advertised are not endorsements or recommendations by Oak Street Funding of the third party websites, goods or services. Oak Street Funding assumes no responsibility for the content of the ads, promises made, or the quality/reliability of the products, services, or positions offered in any advertisements. 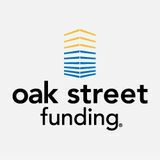 Oak Street Funding 8888 Keystone Crossing, Suite 1700 Indianapolis, Indiana 46240 844-395-8245 Loans and lines of credit subject to approval. Potential borrowers are responsible for their own due diligence on acquisitions. California residents: Loans made pursuant to a California Department of Business Oversight, Finance Lenders License (#6039829). The materials in this paper are for informational purposes only. They are not offered as and do not constitute an offer for a loan, professional or legal advice or legal opinion and should not be used as a substitute for obtaining professional or legal advice. The use of this newsletter, including sending an email, voice mail or any other communication to Oak Street, does not create a relationship of any kind between you and Oak Street. © 2019 by Oak Street Funding LLC. All rights reserved. Any duplication without prior written permission is strictly prohibited. successor, or expand your headcount, the strength of your connections will define your success. Wishing you future success. REFRESH Some people will tell you we’re more connected than we’ve ever been before, thanks to technology such as cellphones and social media. It’s a safe bet that you’re connected to many clients through Facebook®, LinkedIn®, Instagram®, and other platforms. But is your digital network a real network? By that, we mean do you truly have relationships with your online “friends” and “connections”? There’s a big difference between pressing “like” on a photo of someone’s child and actually knowing the child’s name and age. As we become more dependent upon digital channels to keep in touch with the important people in business and our personal lives, we replace deep connections with superficial relationships. We may say we have 462 friends on Facebook, but how many of them would we choose to confide in or invite for dinner? When it comes to our business connections, digital networks make it easy for us to be lazy, believing we’re doing a good job of staying in touch. If we’re honest with ourselves, we know a comment on a social media post pales in comparison to an in-person conversation or a phone call. That’s why it’s so important for us to make the effort to socially refresh our networks by taking time to surround ourselves with clients, prospects, and colleagues. The Power of Referral Networks Have you ever considered doing an analysis to see if there are any benefits of building partnerships with other insurance businesses? A great way to grow your business organically is to build a relationship with a referral partner or create a referral network. Referral networks are made up of like-minded business professionals working together to generate business for each other through referrals and word-of-mouth marketing. Referrals and word-of-mouth marketing can be very valuable. Research by the American Marketing Association has found that recommendations from peers are 2.5 times more responsive than any other marketing channel and that referred customers are also more valuable as they generate higher margins and higher retention than other customers which is beneficial in both the short and the long run. 1 If your product offerings include personal lines like property and casualty, consider finding a referral partner that offers commercial lines or personal lines that you don’t offer such as health or life insurances. Consider also including other makesense partners beyond insurance. Perhaps there is a registered investment advisor, certified public accountant or an attorney that can refer business to you and you can respond in kind. While word-of-mouth marketing and referrals are some of the best ways to produce leads and generate new business, it is important to take measured steps to insure the best outcome when selecting referral partners or creating a referral network. And, of course, you will need to offer the best possible customer service experience so potential partners will want to work with you — since as you are vetting them, they will be vetting you. Below are six steps that will guide you in creating successful partnerships or referral networks. What are your strengths? Where are there gaps? Think beyond insurance. Would creating a strategic partnership help provide your customers with a product or service that you currently do not offer? Many times these characteristics will be based more on wealth than on any other demographic. You may already have an idea of who you want to approach to be a referral partner. If not, identify potential partners by talking to your sphere of influence as well as your customers to see if they have recommendations. Gather their opinions and also check online reviews in order to make sure possible partners offer the same first-class service that you provide so you will maintain your reputation for quality. Once you have identified potential partners, set up oneon-one meetings to share your ideas and to determine if creating strategic partnerships would benefit both of your businesses. Ask how you can best help them. Effective two-way communication will help to build trust and also determine if collaborating is the best plan of action for all parties. In order for referrals or word-of-mouth marketing to be most effective, take time to learn about each other’s businesses. What are your products and/or services? Who is your ideal client? What makes your products or services unique? Why might your products or services be of interest to the other’s client? In order to promote each other effectively, provide business cards and content that can be used when referrals are made. Self-reflection can be an important tool, no matter where you are in your career. Self-reflection provides an excellent way to start developing your goals. It lets you take a break from your busy schedule and the time you spend serving the needs of others, so you can focus instead on yourself. When you self-reflect, you concentrate on your past actions, your successes, mistakes you’ve made, and your beliefs and character. Reflecting involves taking time to examine each of these thoughtfully. Rather than simply remembering what happened, you can explore why it happened and how your actions played into it. Given a chance to go through the same situations again, what would you do differently? What should you have noticed that escaped your attention? You can question yourself in a constructive way that will help you sharpen your skills and become more effective. 6 Make sure you block out enough time for your self-reflection, so you’re not distracted by work that has to get done or checking the time to make sure you’re not late to a meeting. Also choose a location where you’re comfortable and won’t be disturbed. And, turn your phone off, too.7 We created the worksheet at right to help you start the process. Review it before you begin reflecting to ensure that the questions address what matters most to you. And be sure to write your responses down, because that will create a document you can review later and use as a measurement for your success in achieving your goals. 1 Cebollero, Chris, “It’s the Season for Self-Reflection,” forbes.com, December 14, 2018. 2 “How important is goal setting and reflection for your career?,” npowerjobs.com, March 24, 2016 3 Commission on Dietetic Registration, “Professional Self-Reflection Portfolio Guide,” undated. 4 “New Directions in Goal-Setting Theory”, Edwin A. Locke, Gary P. Latham, October 1, 2006 https://doi.org/10.1111/j.1467-8721.2006.00449.x 5 npowerjobs.com, op. cit. 6 Cebollero, op. cit. 7 ibid. My two personal strengths are: 1. 2. My top two professional strengths are: 1. 2. My clients would describe me using words like: My colleagues would describe me using words like: Weakness My two biggest personal weaknesses are: 1. 2. My two biggest personal weaknesses are: 1. 2. The one weakness I wish to improve this year is: I will do these two things to improve: 1. 2. Joys My biggest joy in my personal life is: My biggest joy in my professional life is: In my work, I primarily enjoy: I wish I had more time to: Accomplishments My proudest accomplishment of the past 10 years is: My proudest accomplishment in the last year is: I believe my proudest accomplishment in the coming year will be: The Future I expect to retire by: My retirement dream is to: My Goals for Next Year My two professional goals are: 1. 2. My two personal goals are: 1. 2.
invest your time into getting to know them. Many property and casualty insurers are finding the need to integrate their cloud and non-cloud systems to provide a cohesive customer experience whether they are communicating through print, email, the web or on mobile devices. To complicate matters, many insurers have multiple systems for customer communication that vary by department and business line. Complex software applications known as customer communications management (CCM) solutions do more than allow you to contact clients on a regular basis. These responsive systems map customersâ&#x20AC;&#x2122; journeys by integrating communication channels and monitoring and recording data and interactions. 2017 was an expensive year for catastrophic claims. The California wildfires, which burned more than 10 million acres, made up 30% of all fire loss costs. The trend will likely worsen when numbers are finalized for the 2018 Camp and Woolsey fires. Traditional practices for scoring fire risk are not as robust as new data driven products. These products look at information such as geographic data, road conditions and routes between homes and fire stations to more accurately assess risk when setting premiums for these policies. Automation: No substitute for human connections Great people will always be a key part of the relationship intensive insurance business. After all, building strong relationships with clients provides an almost unbeatable competitive advantage. In our busy world, however, personal touches become increasingly more difficult to manage. In order to provide value to your customers and still grow your business, it makes sense to strategically automate certain processes such as repetitive tasks or data analysis. The key is to select those processes to automate that will free up more time for client interaction and enhance the customer experience. relationships can relieve stress, keep employees coming back every day, and improve engagement throughout the company. will flock. Relationships can be built further at activities outside of work, where employees can feel free to bring their full selves to the table. Numerous and varied options will really provide the opportunity to join, including volunteer time, walking or gym clubs, or happy hour events. 3. Remember virtual employees. With increased technology comes the opportunity for work to be accomplished outside of the office. Virtual or remote employees can easily feel disconnected from their team, since they aren’t there for the parties, events, or interpersonal events. Do what you can to keep them engaged, including cross-departmental projects, video-conferencing opportunities, and by bringing them to the corporate office on a regular or annual basis. 4. Stay positive and celebrate. Work can be stressful, but that doesn’t mean we need to linger on the negative effects. Rather, a positive and realistic outlook on opportunities, performance, and teamwork leads to further support within the company. Find the time to celebrate the great things happening, like anniversaries, achievements, babies, and birthdays. Recognizing and sharing joy in these successes and milestones will build connections and boost morale. 5. Practice good conflict resolution. Sometimes even the best intentions can’t prevent conflict in a work environment. Left unresolved, conflicts can simmer, escalate, build resentment, or turn into a serious issue. Distributing a respectful and constructive conflict resolution policy enables everyone at the company to proactively feel empowered to handle conflict and less likely to avoid issues when they arise, avoiding lingering tension that can be detrimental to relationships. 6. Share knowledge. If employees have different skillsets, travel to conferences, are constantly learning new things, or have personal hobbies that may be interesting or useful to colleagues, set time aside for knowledge sharing. Not only does this provide an opportunity for colleagues to get to know each other, but it will enable employees to become more well-rounded in their professional lives as well. THE FASTEST GROWING AGENCY NETWORK FOR A REASON. Want to find an insurance agency to buy? Join today! Visit osfagencyexchange.com Our new Buyer Directory gives you the chance to meet potential sellers that would normally be beyond your current network. Sign up today to receive alerts when new buyers or sellers join our marketplace!